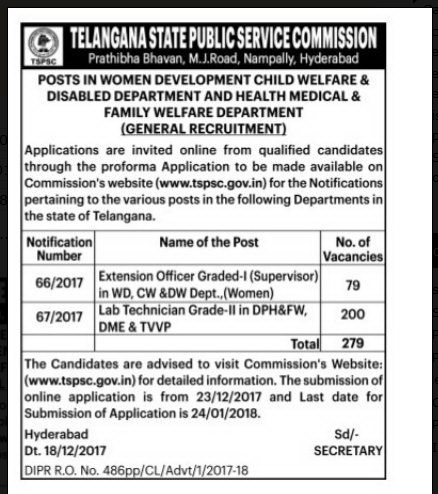 TSPSC Vacancy Notification 2017 – Extension Grade I Supervisor Posts - Telangana State Public Service Commission Recruitment 2017: – TSPSC has announced a notification for the recruitment of Extension Grade I Supervisor Posts . Interested candidates may apply by 11th December 2017. 11) B.Sc. – Food Technology & Management, Botany / Zoology & Chemistry / Bio – Chemistry. 3. Last Date for Hall Tickets Downloaded: 07 Days before Commencement of Examination.